Black Atlas, the American Airlines site dedicated to connecting to the African American traveler, is sponsoring a sweepstakes trip for two to welcome in 2011 from New York City. New and current registered users of BlackAtlas.com will be entered in the contest to win the prize. American Airlines, through BlackAtlas.com(SM), the first online travel community for people interested in Black culture, is hosting a sweepstakes for a chance to win a trip for two to spend New Year’s Eve in New York City. One lucky winner of the ‘New Year’s Eve in New York City Sweepstakes‘ will receive a pair of round-trip tickets to New York, hotel accommodations for two nights and $300 in spending money to help ring in the New Year. All registered users of BlackAtlas.com and those who register by 11:59 p.m. (EST) on Dec. 15, 2010, will be entered for a chance to win the ‘New Year’s Eve in New York City Sweepstakes.’ The sweepstakes is open to residents of the 48 contiguous United States and the District of Columbia who are 18 years and older and limited to one entry per person. Other terms and conditions apply. New Year’s Eve in Times Square has been celebrated every year since 1904. 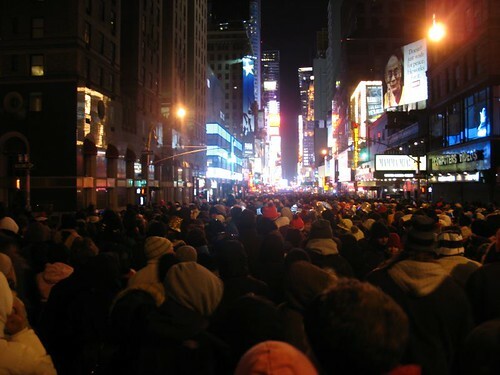 The Times Square Alliance has already posted the event guide for New Year’s Eve complete with an interactive timeline of the Times Square tradition. Check it out if even if you’re just planning to watch the celebration on TV. Black Atlas is sort of a cross between an online travel magazine and Trip Advisor for the African American travel audience and just one of the several American Airlines sites targeted toward specific segments of the travel market. Go here to enter or for more details.